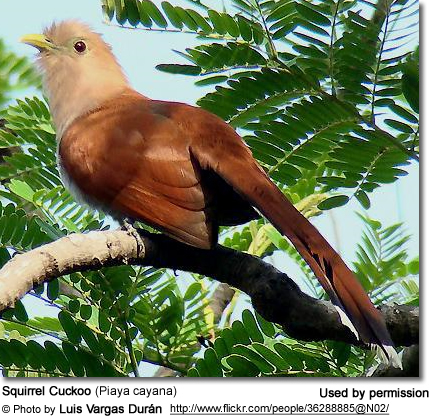 Piaya is a small genus of cuckoos which occur in tropical Central and northern South America. They occur in forests or mangrovesThese birds are of variable size with slender bodies, long tails and strong legs. Black-bellied Cuckoo, Piaya melanogaster : The Black-bellied Cuckoo (Piaya melanogaster) is found in Bolivia, Brazil, Colombia, Ecuador, French Guiana, Guyana, Peru, Suriname, and Venezuela. Piaya cuckoos, unlike many Old World species, are not brood parasites; they build their own nests in trees and lay two eggs. Parasitic cuckoos lay colored eggs to match those of their passerine hosts, but the non-parasitic Piaya species, like most other non-passerines, lay white eggs. These are vocal species with persistent and loud calls. They feed on large insects such as cicadas, wasps and caterpillars (including those with stinging hairs or spines which are distasteful to many birds). Squirrel and Black-bellied Cuckoos are large and powerful species, and occasionally take vertebrate prey such as small lizards.